Silicones (/'sIlIkən/) are polymers that include any inert, synthetic compound made up of repeating units of siloxane. This is a functional group of two silicon atoms and one oxygen atom frequently combined with carbon and/ or hydrogen. They are typically heat-resistant and rubber-like. Silicones are used in sealants, adhesives, lubricants, medicine, cooking utensils, and thermal and electrical insulation. 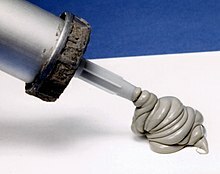 Some common forms include silicone oil, silicone grease, silicone rubber, silicone resin, and silicone caulk. Silicone is also used for cosmetics. Silicone has very little to do with the element silicon (/'sIlIkən/). This page was last changed on 16 May 2015, at 15:11.